On the back side of the gratitude tag the words “thank you” are written as many times as is possible. On the back of the joy tag are smile faces, and hands clapping and hands raised in prayer. Backing up hope is more hope and more hope and more hope. 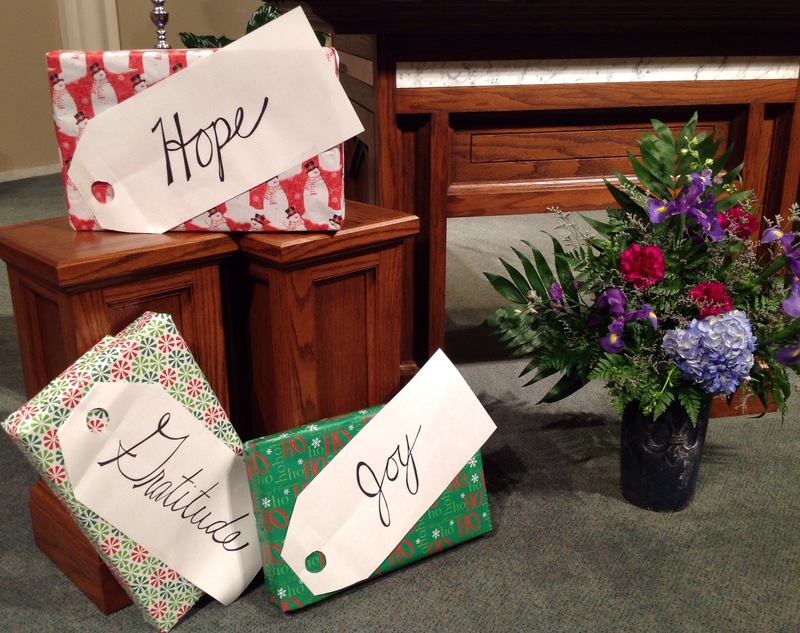 Which gift has God given to you this year: gratitude, joy or hope? And of those three gifts from God: which one would you like to be able to give to someone else in your life? Gratitude? Joy? Hope? A young man in our parish responded quickly that God had given him joy this year: a lovely wife and a new baby. And he did not hesitate in the least to say that he would like to give his mother the gift of hope. Gratitude, Hope, Joy. Which of the gifts has God given to you this year? Which one would you like to give to someone at Christmas? Good reminder, I absolutely chose “gratitude” ! I could thank God all day long and still miss so many things He’s done for me!!! And be grateful for loving Him!!!!! !